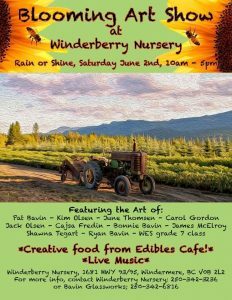 One day only at the Winderberry Nursery! Come see the art of 10 talented local artists and the WES grade 7 class. This show will be featuring works by Pat Bavin, Kim Olsen, June Thomsen, Carole Gordon, Jack Olsen, Cajsa Fredin, Bonnie Bavin, James McElroy, Shawna Tegart and Ryan Bavin. Along with meeting the artists and possibly finding a unique piece to take home, you will get to enjoy live music and can try some creative food from Edibles Cafe!